How much is this statue? And what is its name? She is cute! Over the years I have seen these sell at the flea market for $1-5. I have never seen one sell on eBay. Usually the sellers are asking too much. They usually start them in the $10-15 range and sit unsold for months. There were just too many of these made and very little demand. As for her name, it is either girl with vanity or girl and vanity. Sadly, figurines are considered out of date and the market is flooded with all sizes, all styles, many different brands and very, very few are selling at any price. A recent similar figurine sold on eBay for .99 + small shipping charge. It probably cost the seller to sell it and they certainly made no profit. Hopefully it was not broken during shipping. Most of these figurines were not given actual names so all you can do is search with "girl with vanity" but I believe your search will reveal the same information that Pghgirl stated in her posting. I have even seen similar figurines show up at "white elephant" gift parties as most people just do not want them in their homes anymore. I did see one of these for sale on eBay but the seller had removed it (no way to tell how long it had been for sale). Since the seller had a good description I decided to reprint it (the item is no longer for sale - from 2016). 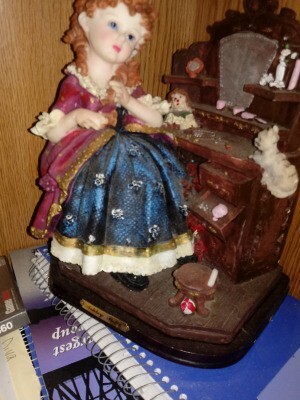 Old Ashley Belle Figurine in Resin. Shows a girl from the 1800s sitting in front of a vanity set, combing her hair. Wearing an 1800s mid-century dress. The dress is blue and burgundy. It has a lot of details on the vanity like a doll, make-up, jewelry, a pair of scissors. Drawers opened, a doll chair on the floor, a small ball underneath it and a kitten climbing the vanity. It measures L 8", W 8" & 10" Tall. This listing may not be available to review as eBay does eventually remove them and this one ended in 2016.